With a smart phone, you don’t need a watch to tell time anymore. But there are two reasons why you should wear one anyway. First, and most important: It’s impolite to look at your phone while you are in a meeting. You may be able to get away with it in a large meeting, but in a small meeting, you really shouldn’t even try. You may only be checking the time, but it looks like you’re checking email or worse. There’s no way to surreptitiously check the time on your phone because you have to hit the Home button to bring up the Home screen. That’s an unambiguous gesture. But a watch? It’s easy to flick your eyes over your watch while you’re taking notes, reaching for your water glass or taking a pen out of your bag. If you’re really skilled, you can do it while talking to someone without even causing a break in the conversation. Michele has brilliantly carved a niche for itself in the field of watchmakers, producing watchbands in new hues, a number of materials (leather, grosgrain and silicone), and textures (alligator, crocodile, calf-skin) every season. In the current collection of Michele watches, it seems they’re all decorated with pave diamonds — beautiful, but more expensive and that’s a shame. I bought a Michele watch in 2003, when the brand was fairly new, and many of the models at that time were stainless steel with mother-of-pearl faces and very affordable. 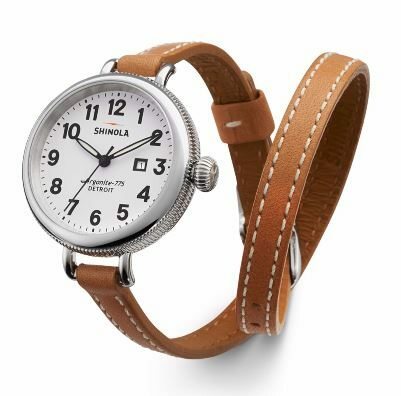 Fortunately, the void has been filled by Shinola — a relatively new watch company based in Detroit. Shinola chose Detroit for its headquarters with purpose, so if watching the recent travails of this great American city have caused you a little heartache, here’s an opportunity to support Detroit and U.S. manufacturing. I am reserving judgment on the Apple Watch for now, but my husband (Gadget Enthusiast) has ordered one so I may amend this post in the future. I still prefer to wear a watch to using my phone. It’s so much faster to glance at my wrist than to take my phone out of my purse or pocket. LOVE this and am so glad to see watches coming back! Love the green and black dress, too….